You have completed the training needs analysis. You have documented the results and confirmed with the business unit manager that training is indeed warranted, because you have confirmed a lack of needed skills and knowledge. Now—you are to begin designing learner-centered training. Here are a few tips to get you started. Want even more insight? The ATD Master Instructional Designer™ program explores new design models and techniques for developing learner-centered training. Geri is president and principal consultant of Geri Lopker & Associates LLC. Her international client list includes corporations, government agencies, nonprofit organizations, and Fortune 100 companies. Geri has been a performance consultant both as an internal area director of operations for a large healthcare agency, and as an external consultant with clients big and small. Geri has more than 20 years of experience working in the areas of systems, finance, change management, leadership, communication, strategic planning, team building, and customer relations. Geri earned a master's degree in human resources and organization development from the University of San Francisco. She earned the Certified Performance Technologist (CPT) certification in 2003.She earned the Certified Professional in Learning and Performance (CPLP) in 2007. She teaches the nationally acclaimed Human Performance Improvement in the Workplace Certificate series. She has also earned the HPI Certificate. She has received the Total Trainer Certificate from OC-ASTD and is senior faculty for the Total Trainer program. Geri is a past president of the International Society for Performance Improvement, Orange County Chapter. She is also a past president of ASTD’s Orange County chapter. 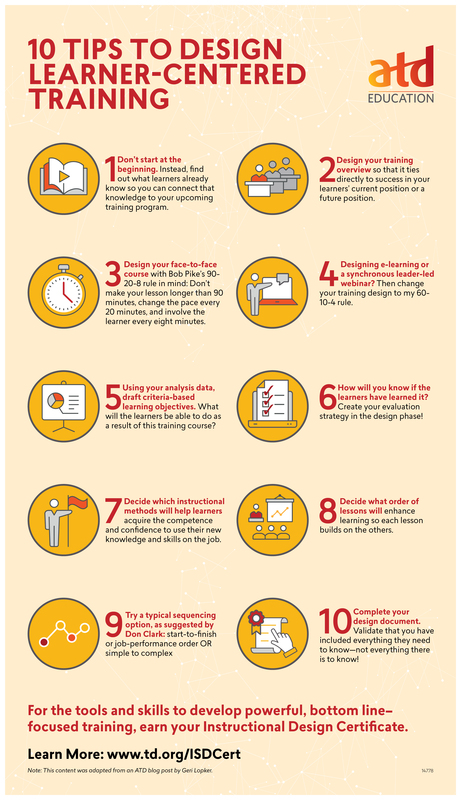 Great infographic for a Training Project Management, Geri!! Thank you for sharing your tools with us.